Second, the U.S. DMCA notice-and-takedown system, which the industry claims is to blame lower royalty rates on YouTube, does not exist in Canadian law. Music Canada wants government intervention into what amounts to a negotiated agreement by increasing potential liability for intermediaries in the hope of extracting better terms and higher royalty rates. However, focusing on Canadian copyright law to do so makes little sense since there is no notice-and-takedown system to amend. 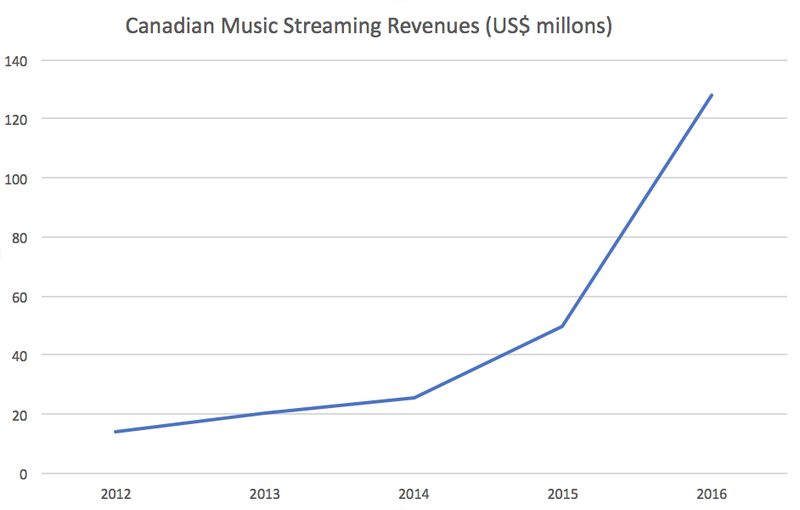 The Value Gap report may fail to make the case for Canadian legislative reform, but it does point to the sharp decline of Canadians who rely on pirated music. The report cites data from an IFPI international report on the listening habits of music consumers around the world. That report provided few details on the situation in Canada, but Music Canada discloses previously unreleased information specifically on Canadian consumers. It reports that Canadians spend 15.4 hours per week listening to music with listening to pirated music only accounting for 6 per cent of that time. A range of authorized and compensated sources, including radio, downloads, and streaming represents the vast majority of music listening habits. In other words, the industry’s data confirms that Canadian consumers show little interest in listening pirated music, preferring many other sources that contribute to its fast growing revenues. Moreover, the same report found that Canada is well below global averages in downloading music from unauthorized sites or stream ripping from sites such as YouTube. Indeed, after years of implausibly claiming that Canadians were among the most active infringers, Music Canada now points to survey data that places Canada far below the global average. Canada is also notably far below the global average when it comes to smartphone use for music (only Japan ranks below Canada), which is likely a function of the high cost of data in Canada. The so-called value gap will undoubtedly form a big part of the lobbying effort on copyright reform in Canada for the music industry (other sectors, including the publishing industry, have also recently adopted it notwithstanding the significant growth in education licensing spending since 2012). Yet politicians should not be so easily fooled: the industry’s own data points to a major digital success story coming on the heels of the 2012 copyright reforms with a surge in revenues and rapidly declining relevance of pirated music. Now give us data for how much the book publishing industry and book authors are gaining from pay-per-read services online and to what extent book piracy is declining. Oops, the argument doesn’t hold up. People aren’t buying cheap e-books, they’re pirating books en masse on lib.gen and aaaarg.fail. Everyone from university administrators and professors and students to huge swaths of the creative class, which sells its labour and ideas and services and products on the open market – graphic designers, architects, artists – believe that books should be free, and are quite prepared to steal them to make their point. And if you look closely at this data for the music industry, you see another interpretation. Take radio out of the mix, for example. Yes, royalties are paid on it, and people still listen to it. But it is not a form of ownership, rather something you listen to in certain situations – driving, at work, whatever. 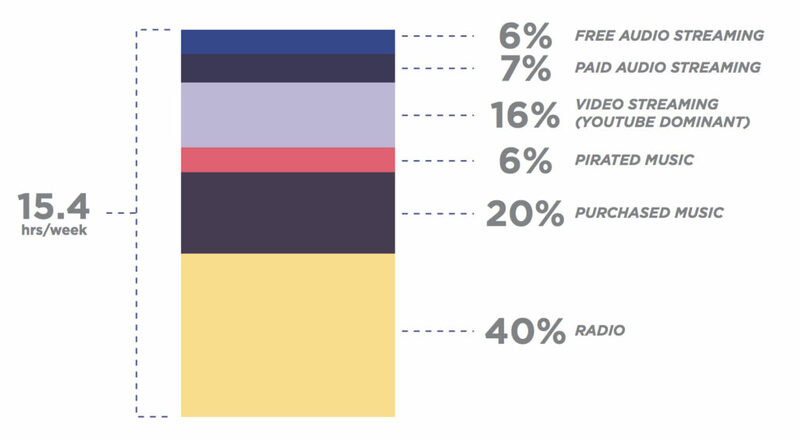 Of the remaining 60% of music consumption, arguably 22% is pirated – given that Youtube is largely a form of piracy. 20% is purchased in hard format and 7% is paid streaming. I would say that 1/3 of music acquisition being pirated is not something to crow about.